* This is my article in BusinessWorld on May 09, 2017. One big issue that failed to land on front pages during the ASEAN Prosperity Summit last week is the creeping protectionism, not through rising tariffs but rising non-tariff barriers (NTBs). Malaysian Prime Minister Najib Razak pointed out during the Summit that NTBs and non-tariff measures (NTMs) from 2000 to 2015 have surged by nearly four times to 5,975 from 1,634. This despite the zero tariff regime for intra-regional trade and the creation of the ASEAN Economic Community (AEC) or the regional single market. While ASEAN was created initially for defense cooperation against regional communist revolutions in the ’60s and ’70s, it has evolved into a platform for freer movement of goods, people and services, and capital or investment. It was a good development and it should be pursued. This coming November, the Philippines will host the ASEAN partners’ meeting composed of ASEAN + 6 (China, Japan, South Korea, India, Australia, and New Zealand) + Russia and US. Mr. Putin, Mr. Xi, and Mr. Trump and other leaders will be coming to Manila. The US exit from the Trans Pacific Partnership Agreement (TPPA) and China-Japan leadership in the Regional Comprehensive Economic Partnership (RCEP) are important developments. By how much have Asian economies improved based on freer mobility of goods, services, investments, and tourism? Here are some basic data (see table). 1. 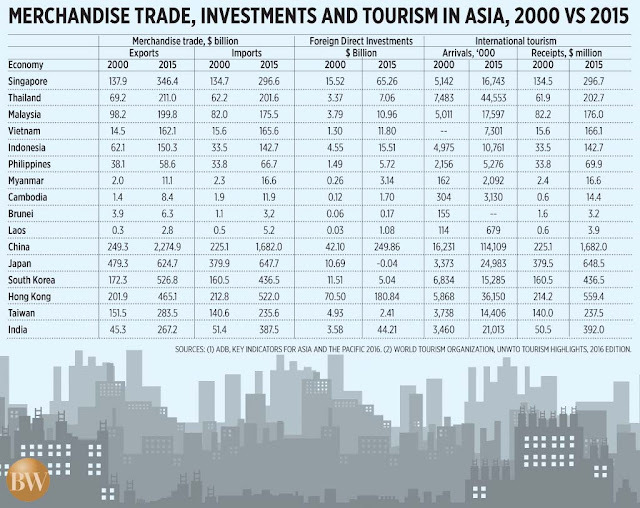 Vietnam: 11.2x in exports, 10.6x in imports, 9.1x in investments, and 10.6x in tourism receipts. 2. Myanmar: 7.2x in imports, 12.1x in investments, 12.9x in tourist arrivals; also high expansion in tourism receipts. 3. 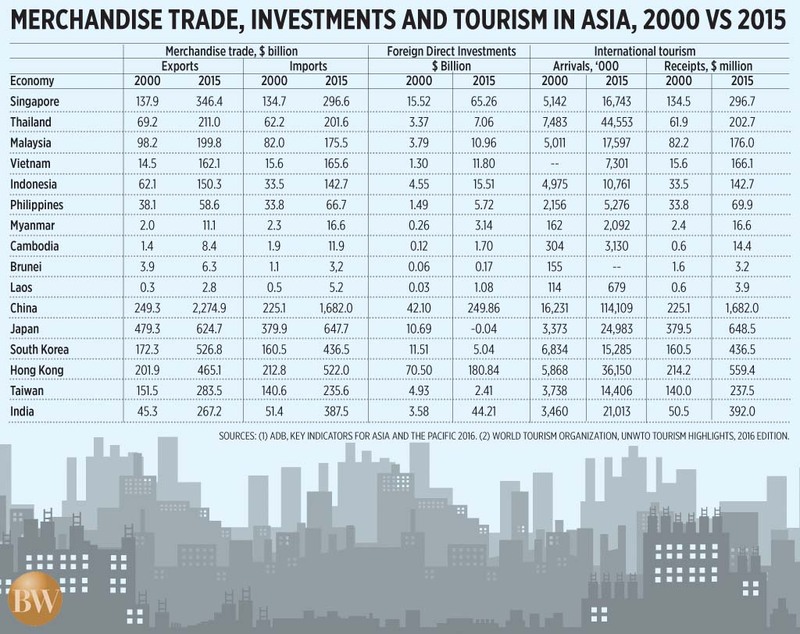 Cambodia: 14.2x in investments, 10.3x in tourist arrivals, and 24x in tourism receipts. 4. Laos: 9.3x in imports, 10.4x in tourist arrivals and 36x in tourism receipts. 5. China: 9x in exports, 7.5x in imports, almost 6x in investments, and 7 to 7.5x in tourist arrivals and receipts. 6. Japan: 7.4x expansion in international tourist arrivals. 7. India: 7.5x in exports, 12.3% in imports, and 7.8x in exports. The Philippines also experienced modest growth in all the above indicators but not fast enough to create more jobs and businesses to its 104 million people. We should take hard lessons from our two small neighbors with huge economic achievements, Singapore and Hong Kong. Singapore with only 5+ million people and just 3 1/2 hours by plane south of Manila, has 6x more exports, 11x more FDIs, attracts more than 3x foreign tourists and more than 4x in tourism receipts than the Philippines. Hong Kong with only 7+ million people and less than 2 hours by plane north of Manila, has 8x more exports, 32x more FDIs, attracts nearly 7x foreign tourists, and nearly 8x in tourism revenues. What small economies Singapore and Hong Kong have that the Philippines lacks are two important policies: free trade (zero tariff, minimal NTBs) and stricter rule of law (the law applies equally to both rulers and ruled, applies equally to unequal people). So while we have improved our GDP size and material wealth via freer trade, freer movement of people and capital, we need to free up more. We should allow more islands and provinces to have their own industrial zones to attract more investments and foreign trade. To have their own international airports and seaports to attract more investments and more tourism. More modern infrastructure, simpler rules, and freer trade will help the Philippines attain what our developed neighbors have already achieved. Drastic reduction in NTBs and the removal of rice quantitative restriction (QR) and protectionism for instance. And less politics, taxes and bureaucracies, more respect for the law by politicians and bureaucrats. Bienvenido Oplas, Jr. heads Minimal Government Thinkers and a Fellow of SEANET. Both institutes are members of the Economic Freedom Network (EFN) Asia.